Tobias Rehberger, Me as You II, 2014, papier-mâché, acrylic, electric light bulb, 24 x 37". From the series “Me as You II,” 2014. In the Ninth Berlin Biennale, DIS describes the present as a moment of paradox, when people are data and the virtual doubles as the real. Miles (or kilometers) west, curator Gail Kirkpatrick presents another contemporary contradiction, with a ten-artist show that dubs sculpture today “solid but also liquid.” In Berlin, artists attempt to give the immaterial networked form. In Münster, that which is already considered fixed and solid is revealed to be unstable and mutable. The Greek myth of Pygmalion recounts how the gods breathed life into a marble woman. Björn Dahlem’s Der goldene baum (The Golden Tree), 2011, a tree of domestic bric-a-brac, and Matthew Monahan’s Lady-in-Waiting, 2011, a teetering pile of refractory bricks and other materials, both seem to await an astral touch. If this feels far-fetched, it shouldn’t. As Steven Claydon’s totemic Antenna (Anesthesia), 2016, reminds us, we plug into and receive signals from the sky every day. Even a basic Internet connection lets us perform acts of divine creation. Laurent Fiévet’s Hollywood Chlorophylle, 2015, is sculpture as YouTube—a looping scene from 1952’s ur–Hollywood musical Singin’ in the Rain tinged green and thus transmogrified into an ode to French-made Hollywood Chlorophyll Chewing Gum. 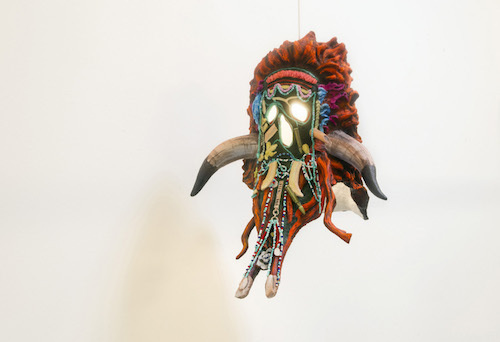 Two pieces from Tobias Rehberger’s 2014 mask series “Me as You II”—one tribal style, with cascading beads and fangs; the second, ghostly blue, with an expression halfway between Casper and Scream, and wrapped in a babushka—really say it all. CCTV and facial-recognition software construct people from data, but if we alter that data, then can’t we become whomever we want—even one another? It’s 2016. If tech is wearable, certainly sculpture can be too.